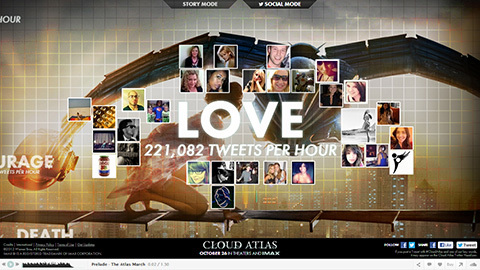 Interactive data-visualisation of real-time Tweets based around the nine themes of the film. Birth, life, death. Past, present, future. Love, hope, courage. Everything is connected. 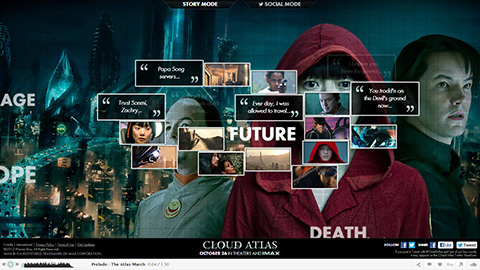 So plays the trailer for Cloud Atlas, the sci-fi epic adapted from the novel by David Mitchell, providing the inspiration for an interactive Twitter visualisation we developed to promote the film’s domestic and international theatrical release. Feeding off real-time data provided by the Mass Relevance social engagement platform, the site’s Social Mode offers an at-a-glance view of how frequently the nine themes are being mentioned on Twitter, with a selection of related tweets available to expand. In Story Mode this swaps out for themed stills and quotes, with integrated sharing across Facebook, Twitter, Tumblr and Pinterest. In contrast to the ‘Russian doll’ structure employed by the book, Mitchell describes the film as more of a ‘mosaic’, reflected in the site’s use of tiling images, Twitter avatars and other content around the nine themes at its heart. As with http://www.glasseyeinc.com/myportfolio/universes-of-fringe/Universes of Fringe – a dynamic data visualisation we developed to promote the release of Fringe Season 4 on DVD – the real eye-opener for this kind of app is the dwell time. Without going into too much detail – we can’t – we’re clearly getting something right in terms of giving fans an experience they want to savour. As always, kudos to our production team: Georgi, Emma, Tom and Cat; all at Mass Relevance; and particular thanks to Dan O. at Warner Bros. for making it happen.